This entry was posted in Posts on Sunday October 15, 2006 by aaron. Geek B: Fanboy! Fanboy! Fanboy! Geek A: Fanboy! Fanboy! Fanboy! Fanboy! Geek B: Fanboy! Fanboy! Fanboy! Fanboy! Fanboy! This entry was posted in Posts on Monday October 9, 2006 by aaron. There’s a pencil on the coffee table next to me and I don’t know where it came from. It’s a “DIXON® No. 2 / HB,” yellow (well… pencil yellow: somewhat orange) pencil with a full (though old, useless and hardened) eraser. It’s sharp enough to write with, but not really ‘sharp’ in an idealized, infinitely-pointy way. I can’t help but wonder how it got on my table, how old it is, and whether it’s actually written anything interesting. Oddly enough, this mysterious pencil reminds me of my maternal Grandparents. They used to hoard things like pencils and cereal, buying large quantities of them at a time when they were on sale. Eventually, when one of us needed to write something or eat breakfast, they would disappear into some unknown crevice of their house and later reappear with a brand-new-ancient writing implement or box of Rice Crispies. I still like to think that there was some hidden room in their house that had a magical machine with dozens of unlabeled buttons and dials on it and a crank on the side that could produce virtually anything that you wanted. I picture it as kind of like the ‘Food Replicator’ in Star Trek, but with more of a Rod Serling than Gene Roddenberry vibe to it. Who knows… Maybe it really did exist. I’m not going to let something as fragile as ‘reality’ rain on my parade. This entry was posted in Posts on Thursday October 5, 2006 by aaron. I’ve moved my aaronflynt.com hosting over to a different provider, and switched the site over from my badly neglected, homemade ASP.NET blogging system to WordPress. I also undertook the painful task of transferring all the old posts and comments to the new system. This entry was posted in Posts on Tuesday October 3, 2006 by aaron. I’ve just discovered a great new text editor for the Mac called TextMate. It reminds me a lot of Homesite, the Windows program I used to use when I first started doing web development. The coolest thing about it is that it takes the concept of snippets from Homesite and brings it to the next level. For example, I’m writing this post in TextMate using a language called Markdown. I’m creating all of the links that you see by simply highlighting the word (like “Textmate”) and pressing the “Command-Control-L” key combination. Doing this activates a command (kind of like a snippet that runs code) that looks up the word in Google and inserts the markdown code ([Textmate](http://macromates.com/)) that links to the first hit. There are literally hundreds of these commands and snippets available for just about every language you can think of. You’re probably thinking “I can do that in Vim or Emacs or some other text editor you use all the time,” right? Maybe so, but what sets TextMate apart is that it’s really really really easy to create your very own commands and snippets. If you work with text a lot on the Mac you should definitely check out the screencasts on the TextMate website. The videos have a distinctly geeky wow factor to them. This entry was posted in Posts on Wednesday September 13, 2006 by aaron. – New Macbook still randomly shutting down 1 month after it was “repaired” by Apple. – No longer playing with the band Penelope from Niagara Falls. – On a diet that forbids me from ever eating white-chocolate-pecan squares again. This entry was posted in Posts on Wednesday September 6, 2006 by aaron. I’ve spent the last couple weeks helping out on a cool project called “Tactical Sound Garden [TSG] Toolkit”. I ported the TSGClient application from VB.NET on Windows to Cocoa/Objective-C on the Mac. The website linked above explains the concept far better than I ever could, but I’ll try anyway. It’s basically a system that allows for arranging and playing back audio at different locations in a physical space. In a way, it’s a superimposition of a virtual world of sound on the actual physical world. You listen to the sounds on your PDA or Laptop while you walk/bike/run/drive around the area that encompasses the ‘Sound Garden’. You can hear the different sounds people have ‘planted’ in different places, and you can also ‘plant’ new sounds or ‘prune’ existing ones. This entry was posted in Posts on Wednesday August 9, 2006 by aaron. This entry was posted in Posts on Saturday July 22, 2006 by aaron. This entry was posted in Posts on Monday July 17, 2006 by aaron. 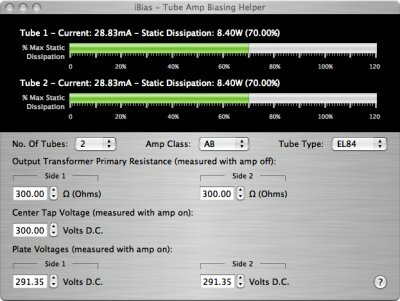 This will probably be of interest to about seven other people on the planet, but I’ve created a simple application to aid in setting the bias on tube amplifiers. It requires a Mac running OS X 10.4 (Tiger) or greater. This entry was posted in Posts on Monday June 26, 2006 by aaron.